During the middle of a florid speech by Duke Red, a noble man of metropolis, some one crashes the party and is shot and killed by a security guard. However the gate crasher was just a robot, and no one thinks anything of it. 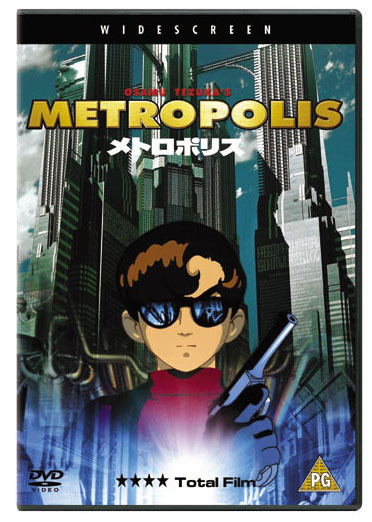 Two visitors to Metropolis are interested by this attack, they are Private Detective Shunsaku Ban and his travelling companion, his young brilliant nephew Kenichi, both of whom have arrived in Metropolis on the trail of a case. Their investigation leads them to a laboratory, where a fire breaks out after they break in. escaping by the skin of his teeth Kenichi has an encounter with a girl, Tima, who is actually the robotic double of Duke Red's deceased daughter. Tima has no idea that she is a robot, nor is she aware that she is imbued with enough power to control the world. Kenichi and Tima escape and they are hunted by the leader of the Marduk party - Rock. Rock was adopted by Duke Red, and he is against robots. The idea that a robot can be loved more by Duke Red than himself angers him. Tima is eventually caught by Duke Red who reveals her robotic heritage and sets her on her way to destroy the world.